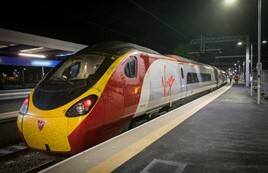 The first ever electric train to run to Blackpool North entered the station on the night of May 14, on a test run ahead of the May timetable change (when electric operation is introduced at the station). The Class 390 Pendolino electric multiple unit (390152) carried Network Rail engineers to check and inspect the new overhead line equipment on the route from Preston. And to mark the occasion, Virgin West Coast created a sand model of the train on Blackpool beach, in anticipation of three additional round trips from Blackpool North to London Euston starting on May 21. Andrew joined RAIL in 2000 as a news and features writer. He has written four books, covered the UK and international rail industries, and led 2005’s successful campaign to save the ‘Night Riviera’ sleeper train. He is also a regular commentator on rail matters on television and radio for RAIL. If there's a cyber attack on our power stations I think we'd be more concerned about our lights, fridges, TV and broadband not working rather than the train network. Its good to see a Class 390 Pendolino that has reached Blackpool North under its own power since the overhead wires were installed and are live. Hopefully Virgin Trains will use the Class 390's on London Euston-Blackpool North via Preston. Aswell Northern Class 319's to operate on Blackpool North-Preston, Manchester Piccadilly/Victoria and Manchester Airport. Northern will soon start operating from Blackpool North with their Class 319’s and Class 331’s. And Transpennine Express will also operate to/from Blackpool North to Glasgow and Manchester. Whilst electrification to Blackpool South isn’t happening and local trains will be using the line.